Weigh butter or measure it by the stick. Softened and melted butter may seem like similar ingredients, but they behave differently when it comes to baking. The two forms of butter serve separate purposes in kitchen chemistry and cannot be used interchangeably. Because they perform differently when combined with your other recipe ingredients and going into the oven, incorporating the butter in the wrong state can throw off your dessert. Whenever you bake, use high quality, unsalted butter. Whether you use softened or melted butter depends on the type of baked good you're making. Cakes and cookies are usually made by creaming softened butter and sugar together. This creaming action forms air pockets in the baked goods. These air pockets fill with steam during baking, creating a tender crust and light texture. Rich yeast breads, such as a breakfast dough, often call for butter that's almost melted and very soft so it blends easily with the warm water, yeast and sugar. To complicate things further, muffins and quick breads are usually made using the "muffin method" of combining the dry ingredients in one bowl, the wet ingredients in another and folding the two together. In this case, you'll use melted butter combined with room temperature milk and eggs. Use a light hand when making muffins and quick breads. Too much mixing can toughen them. The term "softened butter" is somewhat confusing. In most cases, you want butter that's between 65 and 68 degrees Fahrenheit. Professional bakers use the word "plastic" to describe the right consistency of softened butter. It should be pliable enough to blend, but hard enough to hold its shape. When you touch it, your finger leaves a small indentation, but doesn't smash it. This correct texture isn't as important for cookies or bars, but it's critical for fine, light cakes. If the butter is too soft, it won't form the thousands of air bubbles needed, or the bubbles become deflated. Microwaving butter invariably leaves it too soft. Instead, set the butter on the countertop 30 to 45 minutes before you begin baking. Stand mixers heat up the ingredients, so butter can start out a little firmer. Use melted butter for any baked good that needs gentle mixing, such as quick breads, muffins, brownies and even pancakes and waffles. These baked goods rely on baking powder or baking soda for much of their leavening, and don't need creamed butter to rise. Instead, butter's role in these products is to add flavor, color and moisture. To melt butter, place it in a deep microwave-safe bowl and cover it with a lid or paper towel. Heat on high for 30 seconds to one minute. There is no one right way to use butter in baking. Instead, it's best to consider the type of baked good you're making and follow any directions carefully. Some baked goods, such as pie crust, biscuits and puff pastry, use neither softened nor melted butter. Instead, they call for firm, cold butter. 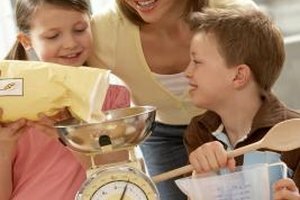 Does Adding an Extra Egg to Brownie Mix Change the Texture? Does Applesauce Make Baked Goods Hard? How Do I Make the Cake Lighter When I'm Baking?